Head bartenders are often in charge of other bartenders and will set the schedules for those working the bar. 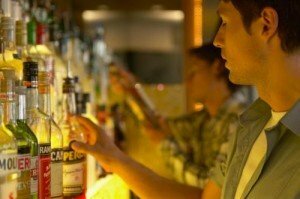 Many head bartenders are experts in a variety of alcohols and cocktails, and some of them also have an extensive knowledge of wines and specialty liquors. What Is a Head Bartender? Only the best and most popular bars, restaurants, lounges and night clubs will have a head bartender. Most smaller venues will only have a selection of bartenders that fall under a general manager. Some select locations, however, will have a head bartender to organize things behind the bar and deal with personnel issues. A head bartender will usually report directly to the bar, club or restaurant manager and will have staff members under their direction. Head bartenders need to be conscientious, knowledgeable and able to think quickly. They will often need to take inventory, deal with personnel issues and advise the other bartenders on specific drinks, liquors an wines. Most head bartenders do not have a formal education but will have many years of experience in the bar industry. Head bartenders need to be conscientious, knowledgeable and able to think quickly. A head bartender will often set their own shifts. Some head bartenders will focus on the management of the bar and will take shifts that are earlier in the day, while other head bartenders will focus on the operations of the bar while it is busiest and take shifts that are later in the day. This depends purely on management style and the needs of the bar management. A head bartender is usually, though not always, responsible for setting the shifts of the other bartenders and finding replacements when a bartender calls out sick. Sometimes a head bartender will have input when hiring new bartenders as well. Throughout operations, the head bartender will often need to ensure that the tills are counted out correctly and that no money has gone missing. The bartender may either take an inventory at the end of the night or supervise the inventory to ensure that the bar is stocked sufficiently to open the next day. Head bartenders may also be called upon to deal with unsatisfied clients. How Do You Become a Head Bartender? Bartending is an industry that values experience, and most head bartenders will be promoted from within. A bar back will become a bartender and a bartender can become a head bartender. To be promoted to head bartender, a bartender needs to show that they have a deep understanding of their craft, can deal with customers well and are driven to succeed. A head bartender will also need to show that they can manage other bartenders successfully. Not every bar requires a head bartender, so those intending to advance within the industry may also need to secure jobs in more prestigious establishments. There are online schools available such as ABC Bartending Online that give bartenders the essentials to enter the industry. How Do You Advance as a Head Bartender? A head bartender usually has the goal of eventually becoming a bar manager or owning their own bar. Those interested in eventually obtaining either of these positions are usually required to have comprehensive knowledge within the industry. Work as a head bartender can meet these requirements. Advancement within the field of head bartender usually requires that the head bartender be extremely conscientious and able to manage other people well. According to O*Net Online, there are related fields in the areas of food preparation. Head bartenders can move into becoming the head of wait staff in restaurants or even as managers within food establishments. There are a myriad of fantastic opportunities throughout the food service and bartending industry for these skilled workers.